How far back do you think human culture goes? You know, the sharing of creative ideas like tools and creation? Decades of study on some basic tools pulled from a cave in South Africa have finally determined that traces of modern human culture surfaced as far back as 44,000 years ago. That’s more than double the last estimates! The San hunter-gatherers of South Africa (one pictured above) still use basic bone, wood and stone tools. Artifacts found in this South African cave are so close to the tools used today that there’s no doubt that 44,000 years ago, a cultured clan was making and using them regularly. They even mastered organic poisons taken from castor beans to tip their spears with. This is a very cool find, and adds some detail to the timeline of human evolution. Considering that our modern anatomy only showed up ~150,000 years ago, it’s exciting to discover that shared tool creation and culture weren’t that far behind. So let’s all try to act a little cultured today in their honor, shall we?? Tell ya what … today is just going to be home to a time-lapse trifecta, okay? Especially with all the Jonah Lehrer stress from earlier. I think we all need a chill-out moment. NASA’s first images from Mercury and Gemini came this morning, then a gorgeous tour through the night skies as seen from the ISS. Now Knate Myers (who did the ISS video) has just posted this tour through the stars and sights of New Mexico. Because of its low population density and minimal light pollution, New Mexico is a skywatcher’s paradise. Much of this video was shot at the Very Large Array, a field of radio telescopes in the middle of the state. Close to 6,000 photos went into this collection, and every one of them is a work of art. I especially like the part about halfway through where he turns off the rotation tracking equipment that follows the stars’ paths during the long exposures, and we get to see the trails extend across the heavens in concentric arcs. HD, full scrizzle, have a great evening y’all! Some beautiful time-lapse to start off your morning. Take the time to just relax and enjoy at least one of these videos. 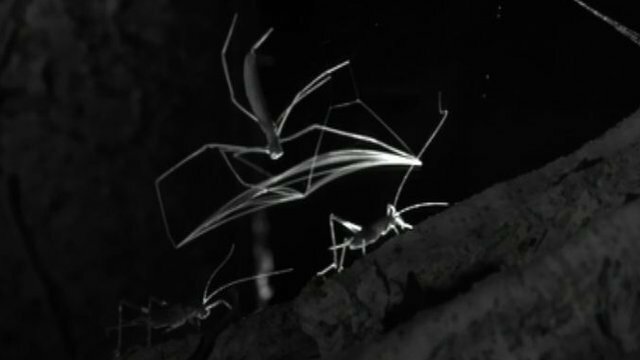 The first slow-mo video of the net casting spider doing its thing: casting a silken net around its prey. It happens in a thousandth of a second, after six hours of complete stillness waiting for the unsuspecting cricket to wander into its trap. Blueprint for the Brain – 6-minute film by PBS and the Public Library of Science explores how the three-pound lump of jelly inside our skulls enables us to do everything that makes us human, and how scientists are now beginning to decipher the architecture of the brain and its secret lives. We are at once both more, and no more, than that three pound lump. And therein lies the beauty of the brain. Synthetic biology is traditionally thought of as repurposing existing or designing new biological parts to do novel things. But in a larger sense, it can be thought of as the ability to create biological systems outside the limitations of pesky things like global and evolutionary time scales. This week marks two really stunning bio accomplishments, each fitting into their own definition of “synthetic”. Whoa, Jellyman: Cal Tech and Harvard biophysicists announced that they had created a sort of “synthetic jellyfish” this week (pictured above left). By taking thin, carefully designed sheets of silicone and layering rat heart muscle cells over them, they were able to make a bell-shaped living device that pulsed and swam just like the bell of a jellyfish. Heart muscle cells, or cardiomyocytes, naturally grow together in sheets and will automatically “beat” in a petri dish (with the help of a little calcium). If you provide an outside voltage (like a pacemaker) they will beat in unison! 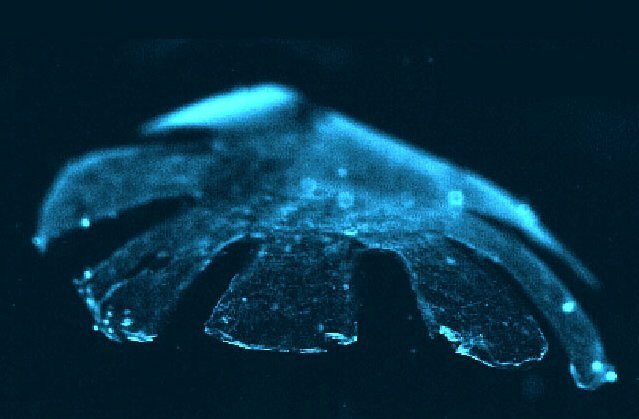 The rat-heart-silicone “medusoid” shape contracted, with the beating cells pulling on the silicone substrate just as a jellyfish’s own muscle cells act on its bell to swim. Of course, this isn’t a real jellyfish, but for extra credit you can read Ferris Jabr’s take on what it would actually take to build one. Byte-size Bio: The other big news this week comes from Stanford and the J. Craig Venter Institute (gracing the cover of Cell this week, above right). Not content with making the world’s first synthetic organism and synthetic genome (Venter’s ambition knows no bounds), they decided to build a computer model of an entire bacterium. Well, mostly. They modeled, on a very general scale, the tiny bacterium Mycoplasma genitalium, which only has 525 genes compared to our ~20,000, and all of its internal processes on 128 computers operating for 10 hours. To complete a single cell division, it required half a gigabyte of data. But you have to be careful before you call this a completely “simulated organism”. 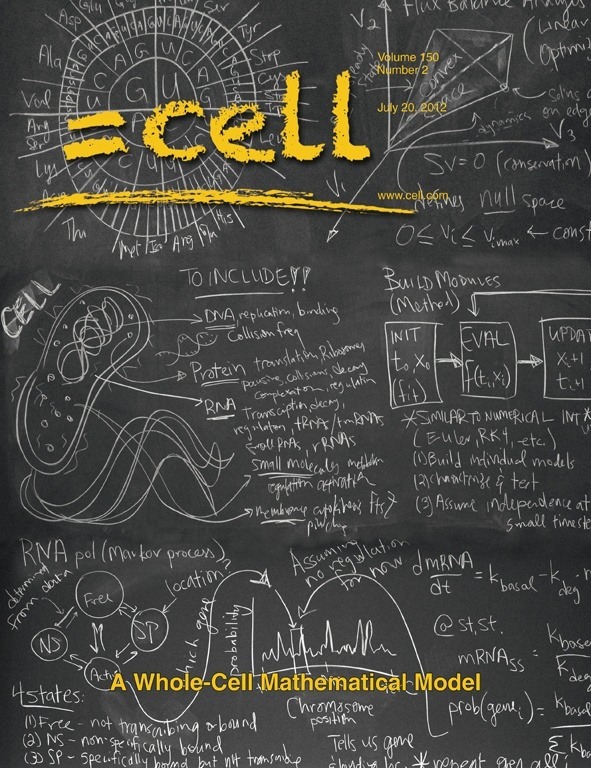 Normal cells have many, perhaps hundreds, of just different types of genes, and they interact in myriad ways … we have just begun to scratch the surface of those networks. Just look at how complicated even the tiny changes in a cancer cell can be! By simplifying their model down to 28 minimal systems, their computer program matched the bacterium’s biology as we know it. But a more “realistic” model is going to be exponentially more complicated. Here’s some collected reactions at Tree of Life. But, still … wow! Modern biology has done a very good job at describing the function of individual genes and proteins, but our next chapter lies in how these interactions build into systems. The “-omics” era will be one where we map how the thousands of parts that we are made of combine to make us whole.Simulations like this will be at the leading edge of that era. But we have a long way to go … how many computers would it take to model the trillions of cells in the human body?